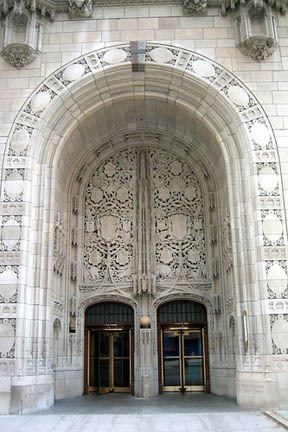 In 1922, the Chicago Tribune hosted an international design competition for its new headquarters and offered a $50,000 prize for "the most beautiful and eye-catching building in the world". 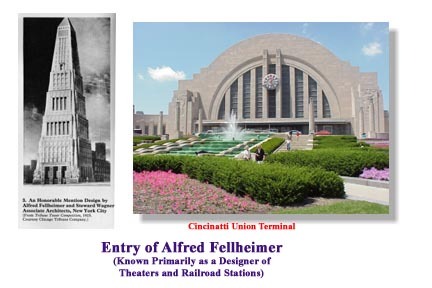 The competition worked brilliantly as a publicity stunt, and the resulting entries still reveal a unique turning point in American architectural history. More than 260 entries were received. The winning entry was a neo-Gothic (i.e. neither left wing nor Modern) design by New York architects John Mead Howells and Raymond Hood. The design uses structural shapes (ogival arches) and ornamentation (gargoyles) and is capped with Flying Buttresses at the top. 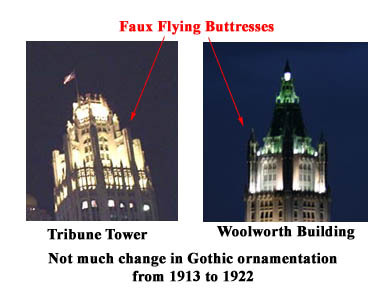 Gothic-skyscraper styles were the vogue in 1922, based on precedent set by the Woolworth Building of 1913. The entry that many perceived as the best—a radically simplified tower by the Finnish architect Eliel Saarinen — took second place. 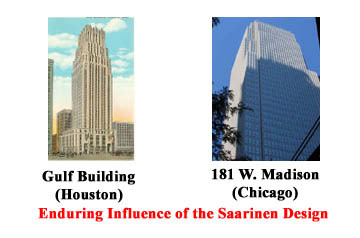 Saarinen's tower, which anticipated the coming impact of stripped-down modernism on building form, was preferred by critics like Louis Sullivan, and was a strong influence on the next generation of skyscrapers. 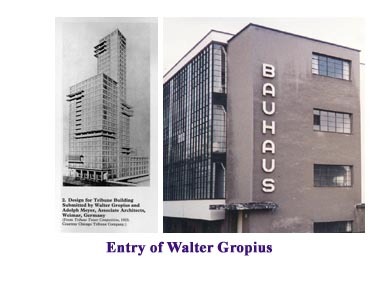 The third place entry was submitted by Walter Gropius, best known as the founder of the Bauhaus in Dessau, Germany. 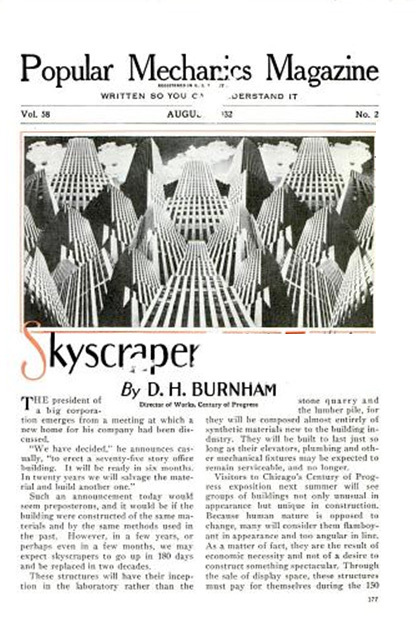 Note that his design for the Tribune building shares many of the same attributes as his iconic design for the Bauhaus building. 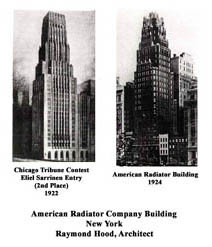 All 260 entries may be viewed in all their glory in a new book The Chicago Tribune Tower Competition : Skyscraper Design and Cultural Change in the 1920s by Katherine Solomonson and Richard A. Etlin ($27.00). 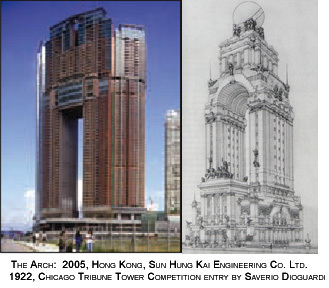 As I was reviewing the various, entries, I was led to some very interesting observations about the extent to which this contest influenced decades of architecture. Before I get into those observations, let's look at the Tribune Tower itself. Construction of the 462 foot high Tribune Tower was completed in 1925. Rene Paul Chambellan contributed his sculpture talents to the buildings ornamentation, gargoyles and the famous Aesop Screen over the main entrance doors. Rene Chambellan worked on other projects with Raymond Hood including the American Radiator Building and Rockefeller Center in New York City, also providing all of the modeling work for that project. Also, among the gargoyles on the Tribune Tower is one of a frog, created by Rene Chambellan to represent himself -- jokingly as he is of French ancestry. The tower also features carved images of Robin Hood (Hood) and a howling dog (Howells) near the main entrance to commemorate the architects. Artifacts from historically important sites throughout the world have been incorporated into the walls. Parts from the Taj Mahal, the Parthenon, the Great Pyramid, The Alamo, Notre-Dame, Abraham Lincoln’s Tomb, the Great Wall of China, the Berlin Wall and 128 others may be seen. The collection is not fixed -- a moon rock was displayed and a piece of steel recovered from the World Trade Center was added. Raymond Hood was a very gifted architect who is best known for his work on Rockefeller Center, particularly the Tower at “30 Rock”. He is also known for the striking McGraw Hill building and the stunning black granite National Radiator Building in London. 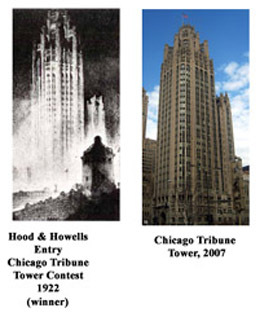 Other entries in the Tribune Tower Contest of 1922 seem to have also influenced these works. Let’s start with the “joke”entry of Adolph Loos, who was no fan of Colonel McCormick, the far-right-wing publisher of the Trib. Note that the "Gestalt"of the Loos’ entry is an elaborate pun on the newspaper “column”. Lost in this humor is the base, a very nicely proportioned 12 story building. 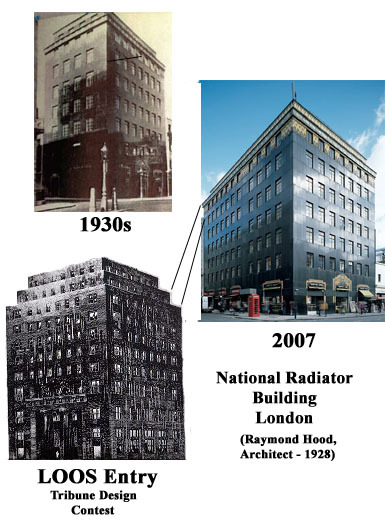 The influence of this base on Hood’s National Radiator Building (in London) is very striking. The entry of Danish architect Knut Lonberg-Holm had been lost to the ages until its recent publication. However, as shown below, it is a clear source of inspiration for the McGraw-Hill Building. Most noticeable is the setback above the thirty-first floor. When the McGraw-Hill publishing Company occupied the building, this setback housed the corporate offices. This provides a transition between the main mass of the building and the ornate horizontal "crown" that is noticeable in the Longren entry as well. The crown hides the mundane elements of the building -- water tanks, elevators and ventilators. 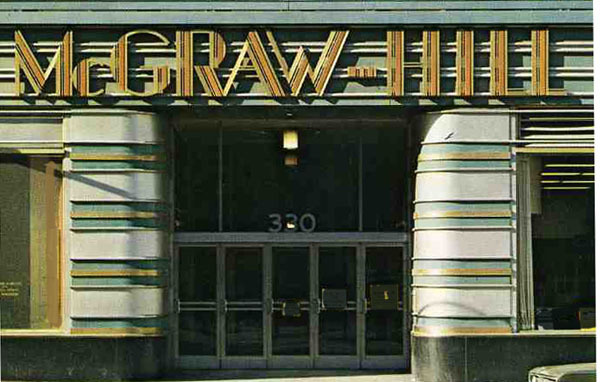 The sign itself was painted with bright colors, although since McGraw-Hill vacated the premises, the company's name has been painted over. 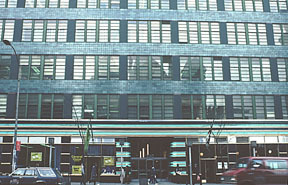 The entrance on Forty-second Street consists of alternating blue and green enameled steel bands with raised bronze and chrome-nickel steel bars -- the ornament continues into the blue-green enameled lobby. The ornament was waxed to retain a satin finish. 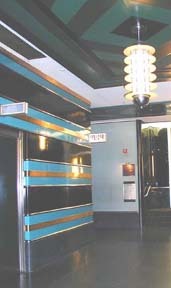 Even the elevator cabs were finished in baked green enamel on steel. The elevator operators wore green uniforms with silver stripes. The metal covered vertical piers are painted a dark green-blue, almost black. The metal windaws are painted an apple green color. A narrow band of vermillion is painted on the face of the top jambs of the windows and across the face of the metal covered piers. Vermillion is also used on the underside of the horizontal projections on the penthhouse. The golden color of the window shades complements the cool tone of the building. The shades have a broad blue-green vertical stripe in the center tying them into the general color sheme. 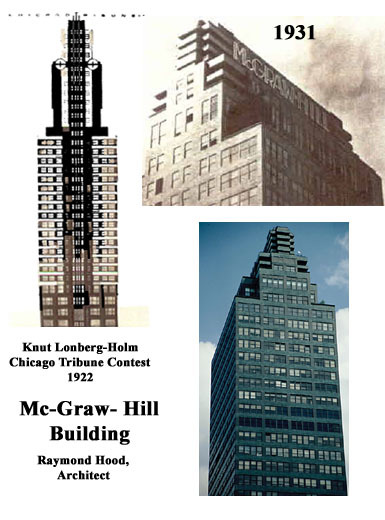 Some of the "gloss" of Hood's creativity (and the similarity to Lonberg's design) can be reduced by more mundane considerations: The McGraw-Hill building is an elegant solution to a real physical problem -- before air conditioning and fluorescent lights, space that was more than 27 feet from a window could not be rented. 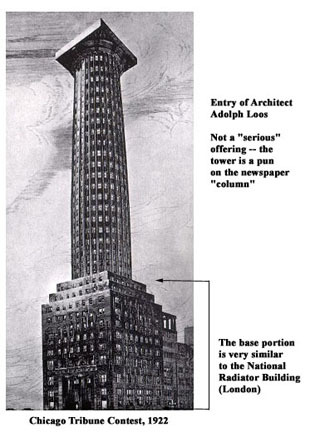 Thant meant that buildings could not be more than 94 feet wide ( 27 + 27 + 2 elevator shafts at 20 feet). The "Thin Slab" building was a fairly elegant approach -- almost all the space was rentable! The only problem was that many people could not accept "slabs" and wanted something like a castle.